Any gardeners will understand one thing- the root of all fruits and veggies begin with teamwork. And that is why gardeners need the right equipment to perform all the works. Gardening jobs like, weeding, digging, watering, pruning, transplanting needs high-quality Trowel, Cultivator, transplanter, and many other items. Many people buy them individually. Many people don’t want to do this hassle; they look for a set that contains all the necessary things. 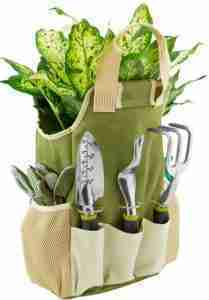 That is why after surveying the market and talk with expert gardeners- we sorted the best gardening tool set that contains all the required items plus comes under budget. Here are top 5 home and professional gardening tools that anyone can use and afford. Read on to know more about them. Fiskers is a well-known brand for garden equipment. 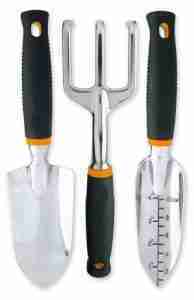 This three garden tools set from Fiskars is a basic set for regular usage. You can do a variety of tasks with the set like a wedding, digging, loosening the soil, etc. also, transplanting plants from one pot to another, aerating, etc. even possible with the tools. The blades of these tools are made to cast aluminum and handles are covered with rubber. The tools are light and compact. Also, they are suitable for hanging on a wall or store in any box or drawer. Comes with all comfortable soft touch garden tools. The handles are contoured and fit on hand naturally. Take small space to stores. Easy to work with, don’t stress your hand. The transplanter is engraved with inch marking so you can better measure the depth. Not suitable for digging hard soil. 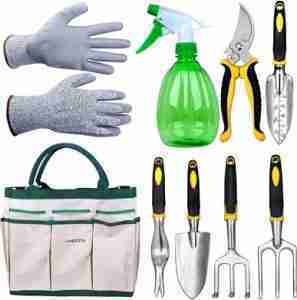 Here is another best gardening tool set that is ideal for different garden works. You could do things with it like, digging, raking, pruning, transplanting, etc. with it. The set comes with all the essential garden tools and a heavy-duty storage caddy. It’s a tote bag with a green accent. This ultimate organizer has some convenient side pockets so you can carry and access all the tools without finding and wasting time. Comes with an organizer including elastic loop pockets. Easy to clean the tools and store. Safe for all age of gardeners. The gloves are not so durable. The clippers get dull quickly. If you want premium quality gardening tools then there you have it. 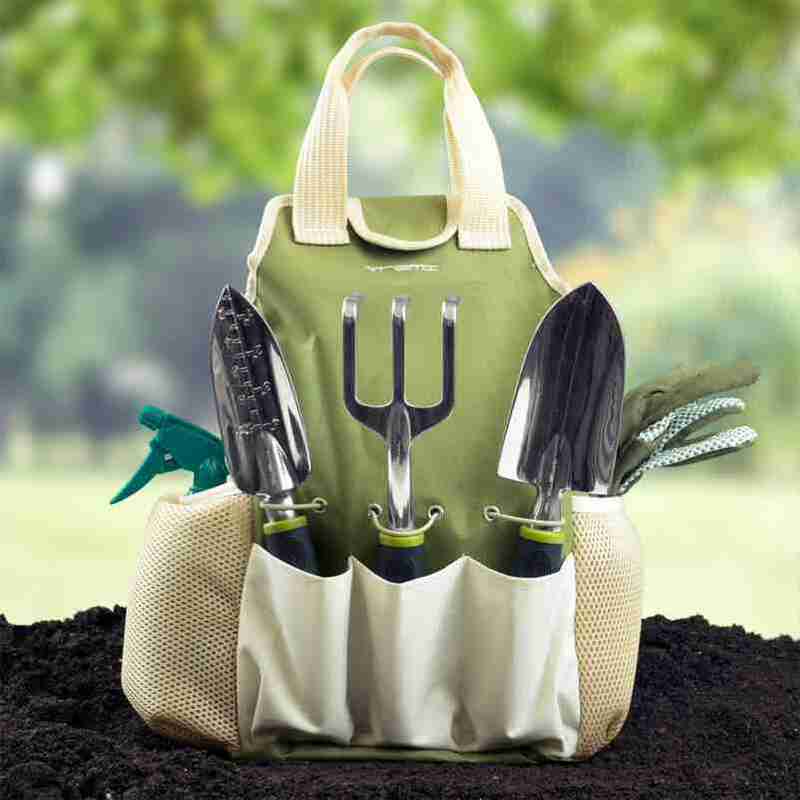 The Scuddles Garden Tools Set is an ideal kind of gardening equipment set that any gardener wants. It’s made of heavy-duty metal along with the quality wood handle. You can hand wash these tools after work and dry them on the machine. With all the tools it includes a cute tote with rooms of so many accessories. That makes sure better access, security, and durability. Ideal for home and commercial usage. The organizer has plenty of room for other tools besides then the Scuddles ones. The water bottle is tiny though. The design is beautiful but feels like the women-type design. Here is another working garden tool that anyone could work, effort, and enjoy. The LANBOZITA Garden Tools is made for helping gardeners to solve almost every trouble. This set comes with nine essential garden equipment that good for weeding, digging, watering, pruning, transplanting and so on. Gives a more secure and comfortable grip. The sturdy canvas storage case also very durable. Tools are sturdy and also comfortable to use. Suitable for home and commercial usage. 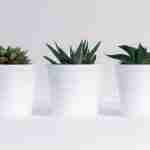 They are not slightly curved as the picture shown. 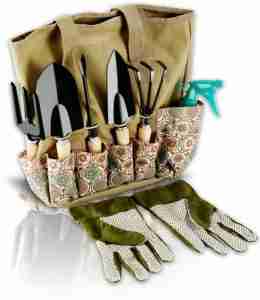 Last but defiantly not least, here is a complete gardening tool set that anyone can afford. 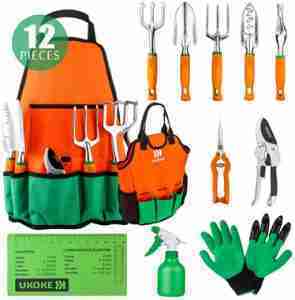 The UKOKE Garden Tool Set a perfect garden tool for any beginners. It has been made to make daily gardening tasks a lot easier. 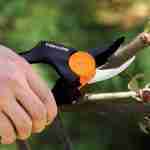 The pruner blade of this model is made of high carbon SK-5 steel. It’s far better than any aluminum bladed pruners. For the handle, they have been using heavy duty cast aluminum alloy which ensures proper strength and durability. All the tools included here is compact, ergonomic, and suitable for long time use. However, you get one year of replacement warranty with this set too. Good for potting soil, sand, fertilizer and loose dirt. Has a storage compartment in the apron for each garden tool. The handle grip feels nice and secure. Not so well for using on compact or stable soil. The tools need to maintain properly to keep the rust attack away. Our editor’s choice for the indoor gardening tool sets is Scuddles Garden Tools Set. It’s the perfect set for anyone like, who is going to start his small gardening or any expert who commercially work for the garden. The other option is better here and would work for the different type of users. The good thing is these equipment sets are not only efficient for working but also adorable at appearances. So, you can choose one of these best gardening tool sets under 50$ for your friends and family as well.